The thriving capital of the Lombardy region has become, over the last decades, an incredibly prosperous international city, aiming to offer the very best to its inhabitants and to its growing foreign visitors. Second most populous city in Italy, after the capital Rome, Milan is surrounded by a metropolitan region – called the “Greater Milan” – which keeps on growing and boasts an estimated total population ranking 4th within the European Union. This constant growth is the very proof of a rise which does not encounter obstacles. And this positive trend has probably started in the ancient past, during the Western Roman Empire, when Milan was already serving as the empire’s capital. The beauty of Milan is certainly not flamboyant like the one inhabiting Rome, Florence or Venice…but it lingers persistently in one’s heart. Its discreet charm is manifest in the city’s elegant courtyards, the neo-classical palaces, the buildings’ light colors, the narrow streets in the city’s centre. 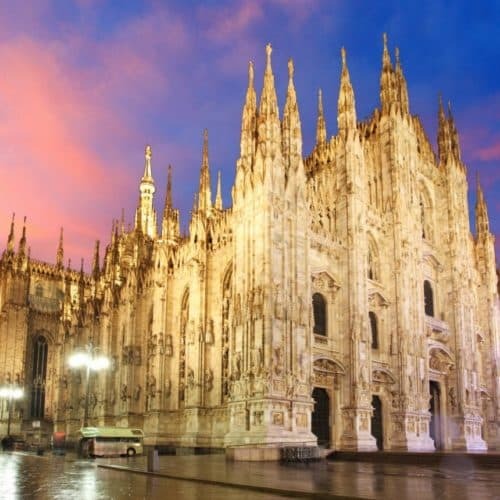 Its vast assortment of churches, buildings and monuments is dominated by the matchless beauty of Milan’s Cathedral, the unanimously renowned “Duomo”, the third largest church in the world. The Cathedral’s splendor has transformed it in one of the most visited places in Milan. Built over several hundred years, it features many contrasting architectural styles, an intense Gothic influence, statues, arches, and pinnacles enriching the intricate, imposing and fabulously refined structure. Visitors don’t have to miss the unique panorama from the Duomo’s roof and a visit to the nearby Royal Palace, the sophisticated Galleria Vittorio Emanuele II, the Sforza Castle and the church Santa Maria delle Grazie. Milan is also, resolutely, a city of the present and the future. A magnetic hub for artists, designers, financial experts, photographers and models from all around the world, Milan is considered a leading “Alpha Global City”. Fashion and Design capital offering, for example, the Milan Fashion Week and the Milan Furniture Fair, it hosted twice, with utmost success, the Universal Exposition, in 1906 and in 2015. The last edition has, in fact, given an extra positive push to the city which has acquired an even more defined personality, new fashionable districts, avant-garde restaurants and new elegant boutiques, in addition to those in the already legendary “Quadrilatero della moda”. You can hire in Milan the best cars: a sport car, a SUV, a super car, a convertible car or a prestige car. Our fleet include latest sports car and supercars (exotic car), like Ferrari 812 Superfast or Lamborghini Aventador roadster.